"Genetics, History and Prehistory: What our Biological Selves can tell us about the Past"
Dr. Jobin is a lecturer at Santa Clara University in the Department of Anthropology and holds a Ph.D. in Anthropological Sciences from Stanford University. 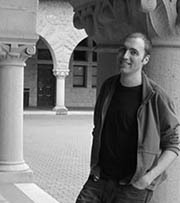 His work has integrated computational and laboratory methods in order to provide statistical pictures of human prehistory. He has a background in anthropology, genetics and organismal biology. His recent work has been focused on novel approaches for investigating the parameters of prehistoric human life, including the comparison of alternate models of ancient human migration and estimation of the size of prehistoric populations.